The showstopper Located on Bowen Island overlooking the ocean, this room is all about the view. But inside, designers Geele Soroka of Sublime Interiors and Thu Watson of TWR Designer Showroom wanted to make the luxe Zuma collection soaker tub the centre of attention. “This is a family home and a modern classic design like the bath gave it an updated ‘olden days’ feel,” says Soroka. Beneath its iconic facade, the tub features all the modern bells and whistles, including rotary whirlpool jets and chromotherapy lights. Colour Conscious A wall of windows captures the environment outside, and Soroka wanted to bring those natural hues indoors, with a healthy dose of white to provide contrast. 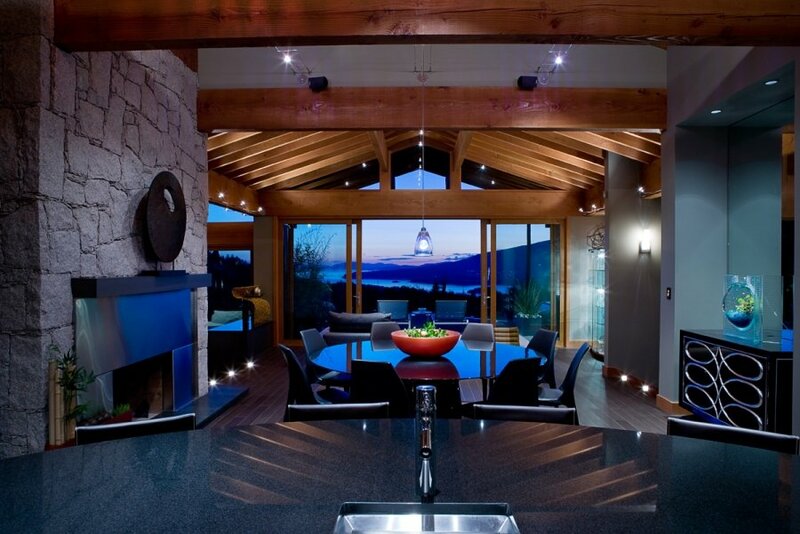 The result is a space that is soothing in daylight, dramatic when lit at night. Spa Zone In addition to the tub, the designers added a steam room kitted out to the max: space for four, chromotherapy lights throughout and a custom Kohler sound system. Oh, and windows that look out over Howe Sound. Furnish It Open-concept space means that bathroom fixtures need to coordinate with the rest of the bedroom. In this case, the designers chose legendary French manufacturer Roche-Bobois for the bed and white leather chaise, accented with a Minotti side table. The oversize chaise might overpower another space, but with the room’s 14-foot ceiling and expansive light, it hits just the right note of drama. Hidden Asset The one tricky aspect of this truly ensuite bathroom design is where to place the, um, throne. Soroka and Watson tucked it behind custom-built vanity to afford some privacy while still awarding the seated a magnificent view.